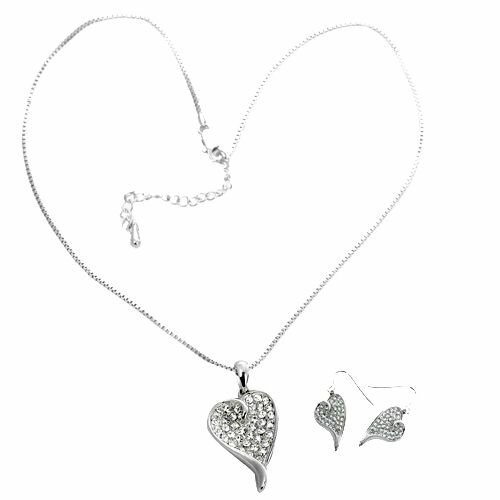 This set includes necklace and earrings. They are made of base metal with rhodium plating. The heart shaped pendant has 39pcs 2mm brilliant clear stones. The box chain has extension and a lobster claw clasp, and fits for everyone. Each earring has 37pcs 1.75mm brilliant clear stonts, and its shape is the same as pendant. Especially these stones are Genuine Swarovski Crystals. You cannot miss such a gorgeous jewelry set, which will bring a significant difference to you. It not only makes you cuter, but also let you stand out from others. Approx. Item Dimensions: The pendant is 19mmX36mm in size. The chain is 16 inches with 2 inches extension in length and 1.5mm in thickness. Each earring is 45mmX16mm in size. This item is brand new and stock has not yet arrived but is on order. It is being offered as a pre-sales to guage volume of interest Please do not order it if you are in a hurry to get it as it can take 30-35 days for the initial stock to arrive. Please do not order it with other items that are in stock unless you choose partial shipment or your entire order will wait for its arrival.